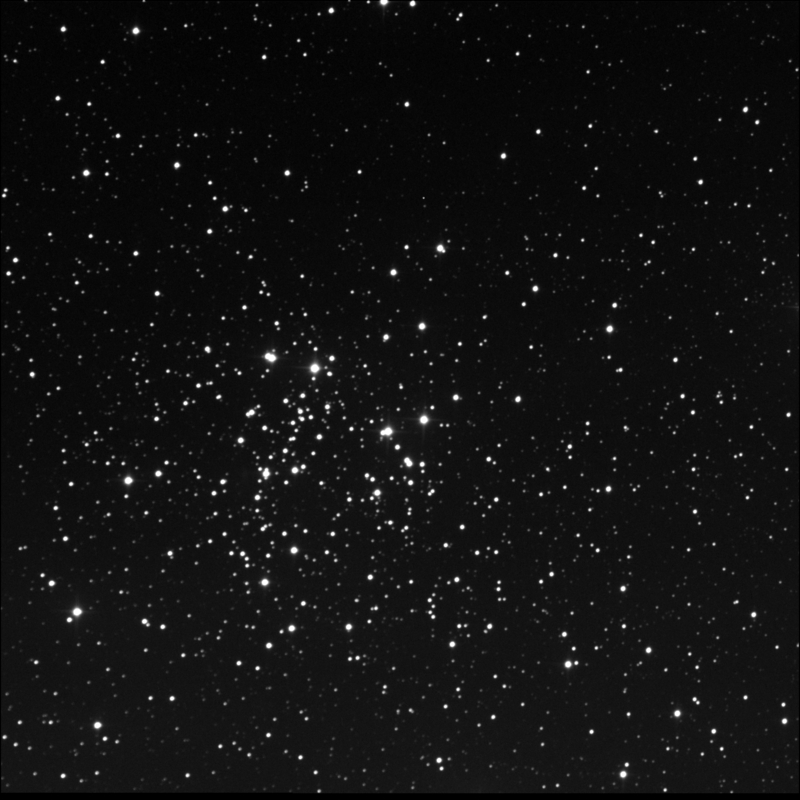 The BGO 'bot imaged open cluster NGC 663 on my behalf. Located in Cassiopeia, it is one of the RASC Finest NGCs. Also called Caldwell 10. There is an interesting line or band of stars, a rift, along the east edge, nearly vertical. Neat. There are a bunch of double stars in here too! Pretty dead centre in the image is a tight double. Barely a black hairline between the two stars. SAO 11968 aka Σ152. About two magnitudes different. South-west of Struve 152 is another tight pair, touching stars, equal brightnesses. That's Σ151. South of 152 is a quad system. STI 288. A is fairly bright. 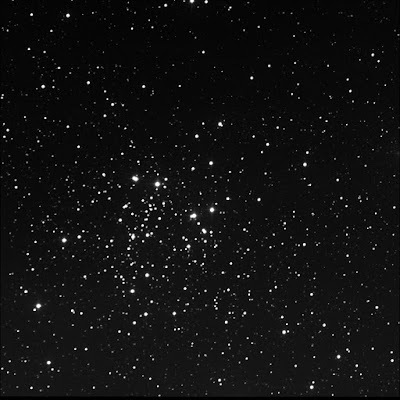 South-east and close is faint B. North-east is C then D. Both C and D, in the image, seem the same brightness. Beyond 151 from 152, about the same distance, further to the south-west, is equal pair STI 285. The angled triple to the south-east is STI 298. B and C are equal and very slightly dimmer than A.
East-south-east of centre is an interesting system. In the image, it looks Saturn like. Vertically oriented, there's a dim, bright, then dim star, all touching. This appears to be STI 295. SkyTools lists the C star but does not show it in the chart. STI 291 is slightly east of centre. It appears in a box or square of stars. The positions are different than in SkyTools. Proper motion? Gravitational forces? Due east of centre is the tight, touching slightly different pair STI 297. An obvious double, touching stars, slightly different intensities, up and left or north-east from centre is SAO 11974. Amazing. Why would some of these be tagged as doubles and not others? It's a mystery to me.